It is a very beautiful Wednesday afternoon and it is time for the weekly Blogger Candidate Forum Primary wrap up. Congratulations to Sec. Hillary Clinton, Donald Trump, Senators Bernie Sanders (D-Vermont) and Ted Cruz (R-Texas). They were the winners of the Arizona primary (Sec. Clinton and Mr. Trump), the Utah Caucus (Senators Sanders and Cruz) and Idaho Caucus (Sens. Sanders and Cruz-held on March 8th). Meanwhile, Sen. Sanders nicely rebounded from getting swept in last week's primaries-winning the Idaho and Utah Caucuses winning 33 delegates in total. You are all probably wondering what happened to Governor John Kasich (R-Ohio). So is the Kasich campaign. Gov. Kasich failed to capitalize on his victory in Ohio last week and came in a distant third in Arizona and very distant second in Utah. Let us see where things stand at the moment. Where do things stand? Big picture-Sec. Clinton and Mr. Trump ran over their rivals in the Arizona primary. This was good news for both frontrunners who are hoping to avoid a prolonged nomination battle. Sec. Clinton added 75 delegates to her tally. However, Sen. Sanders came roaring back in the Utah and Idaho Democratic caucuses, adding 33 delegates to his total. 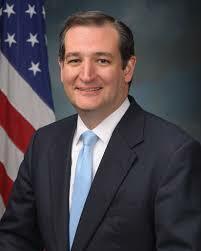 While Sen. Cruz struck back in the Utah Republican caucus, picking up an additional 40 delegates. As of right now, Mr. Trump has 738 delegates and Sec. Clinton has 1,223 delegates. When you factor in the number of unplugged delegates, the number jump to 739 out of 1,237 and 1,690 and 2,383 delegates needed to secure the nomination respectively. Yours truly knows, this is a lot of math to figure out. Blogger is not even going to try to figure it out. Rather, Blogger prefers to focus on the analysis. 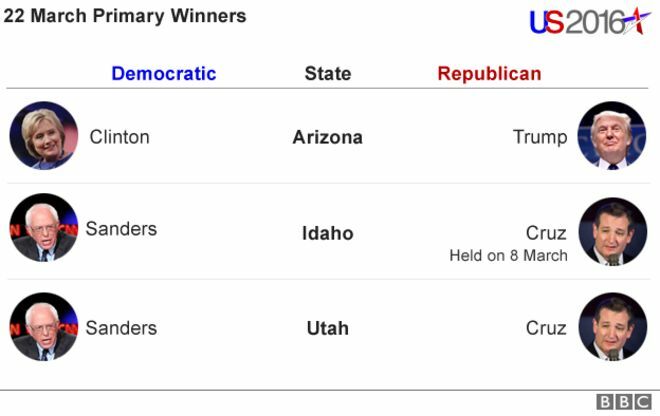 Sen. Bernie Sanders was expected to do well in Idaho and Utah. The Gentleman from Vermont lived up to those expectations. Be that as it may, the Senator does still face an uphill battle to secure the nomination outright. 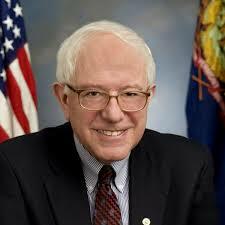 His success is due largely to his appeal to progressives. At a campaign event in San Diego, California, Sen. Sanders took credit for record-breaking turnouts. (http://www.nytimes.com; date accessed 03/23/16). Despite his lopsided loss, the Senator took a moment to point out that he won ten primaries and caucuses so far and accurately predicted that he would win two more before the night was over. Still, Sec. Clinton's commanding victory in Arizona was a much needed psychological boost, especially as the circus heads into states like Alaska and Washington, where Sen. Sanders is likely to win. Any losses could highlight any lingering doubts among Democrats. Despite her victory in Arizona and last week's clean sweep, Sec. Clinton continues to struggle in predominantly Caucasian states that cast their ballots in caucuses. The tenor of Democratic contest has made Blogger truly happy. Instead of engaging in ad homonym attacks and vulgarity, both Sen. Sanders and Sec. Clinton have chosen the high road. This is excellent new for anyone who wants a campaign that is about a vision for the next four years. Blogger still believes that Sec. Clinton will be the Democratic standard bear in the fall, barring a meltdown. Meanwhile, over on the Republican side of the aisle, Donald Trump continues his march to securing his party's nomination outright notching a victory in Arizona Tuesday evening. However, Sen. Ted Cruz continues to chip away at the delegate count securing a victory in the winner take all Utah caucus yesterday evening. Sen. Cruz garnered more than 50 percent of the vote to take all 40 available delegates and keep hope alive for the anti-Trump faction. Donald Trump lost in a landslide to the Gentleman from Texas: 14 percent to 69 percent (Ibid), a not to kind reminder of his challenges with the Republican party's religious voters and the queasiness of many conservatives over the possibility of Mr. Trump as the party standard bearer in the fall. Donald Trump's blew past the combined efforts of Sen. Cruz and Gov. John Kasich to an easy win in Arizona. His commanding victory was due to the "Grand Canyon State's" generous early-voting laws, proving that he could win in a closed Republican primary where Democrats and Independents are prevented from voting. The win was a resounding rebuttal to Sen. Cruz's assertion that Mr. Trump would struggle in the remaining contests because many of them were closed Republican primaries. Mr. Trump's real weakness is in caucus states, "where organizational strength and be decisive." (Ibid) However, after Arizona, there are more such contests. In the mean time, Gov. John Kasich is resisting calls from the Republicans to drop out of the race and join Jeb Bush, Senator Lindsay Graham (R-South Carolina), and former Massachusetts Governor and 2012 Republican nominee Mitt Romney in supporting Sen. Cruz. In a fit of hubris, Gov. 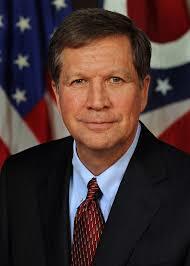 Kasich rejected the call from party officials "...saying that he, not the Texas senator, was the best option to stop Mr. Trump." 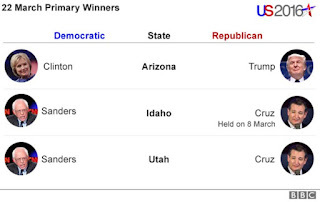 However, the results from Utah and Arizona diminish his argument. The Kasich campaign was dealt a blow when the governor not only failed to win any delegates but also by the surprise endorsement, Wednesday, of Sen. Cruz by Mr. Bush. In a statement, the former Florida governor called the Texas senator a consistent, principled conservative who has demonstrated the ability to appeal to voters and win primary contests. That had to hurt the Kasich campaign. Even Sen. Cruz pressed the matter calling Gov. Kasich a ...complicating factor in a head-to-head competition between him and Mr. Trump. Yet, the Ohio governor presses forward as the Republicans head to Wisconsin on April 5 and his advisors maintain that the final 20 state stretch in the Northeast, Mid-Atlantic, and West Coast will better position Gov. Kasich to stop Mr. Trump. If Blogger were picking a candidate for the fall, right now yours truly would have to choose Mr. Trump. Needless to say this presidential election cycle is rapidly becoming one wild ride. One has to wonder how much longer can Gov. John Kasich sustain his campaign? While Sen. Bernie Sanders's campaign platform continues to resonate loudly among voters, you have to ask yourself how much longer can he continue to battle the Clinton juggernaut? This not to say the Sec. 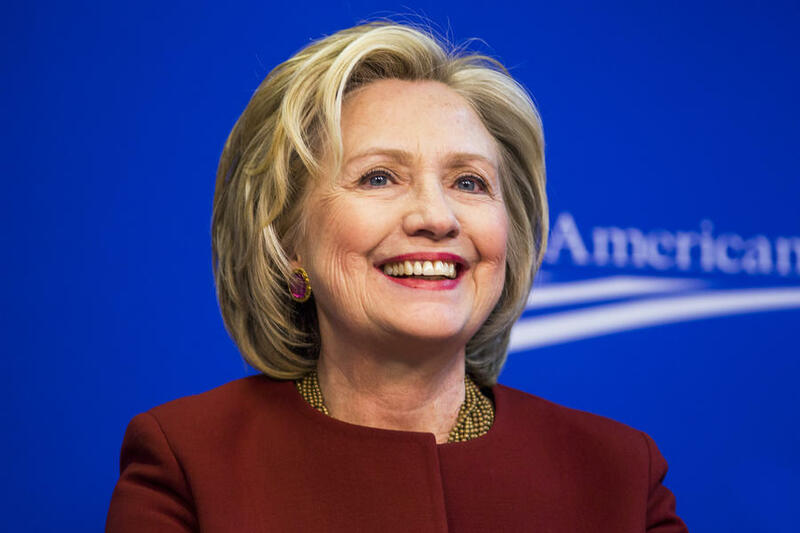 Hillary Clinton is the ideal candidate, far from it. She has her glaring weaknesses and the ongoing investigation into her emails during her tenure as Secretary of State hangs over her campaign like a dark cloud. Both Donald Trump and Sen. Ted Cruz are running on pure hubris. Eventually it will catch up to them both. Buckle up ladies and gentlemen, this campaign is a wild ride to the finish. Program note: Blogger Candidate Forum will be presented once a week, on Wednesdays, beginning March 30. This will continue through the conventions and the General Elections. Please check the blogs for updates.